The Crystal Tower, sometimes known as Crystal-Like-Law, is so named, not because it's made of crystal, but because the structure houses "the" crystal—Transparent Law, the "mystical stone" of the Tower of the High Elves. 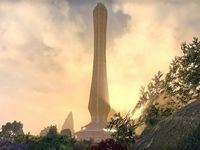 The Crystal Tower is a large structure found on the northern tip of Summerset. 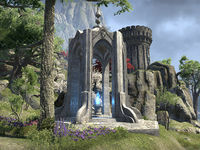 A sacred monument known to the Altmer as Crystal-Like-Law, it is both a place of research and a mausoleum for the honored dead. Opening only to the Sapiarchs' tower sentinels, the tower holds a mysterious powerful crystal called Transparent Law at its apex. The Tower is also said to exist in more than one plane of existence. The Crystal Tower Wayshrine is located west of the Crystal Tower. The merchant Hanursae accompanied by her horse, can be found alongside the road nearby. It first appeared in Arena. The tower is seen in the Cinematic Trailer with a dark purple aura surrounding it. 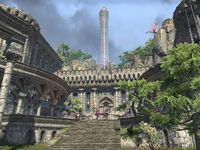 The Crystal Tower can be seen from the western shores of Auridon.